Very traditional. Very girlie. Very romantic. 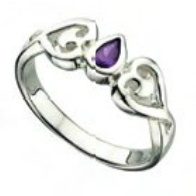 Two hearts carved into a Sterling Silver band, bordering the Amethyst tear of joy.